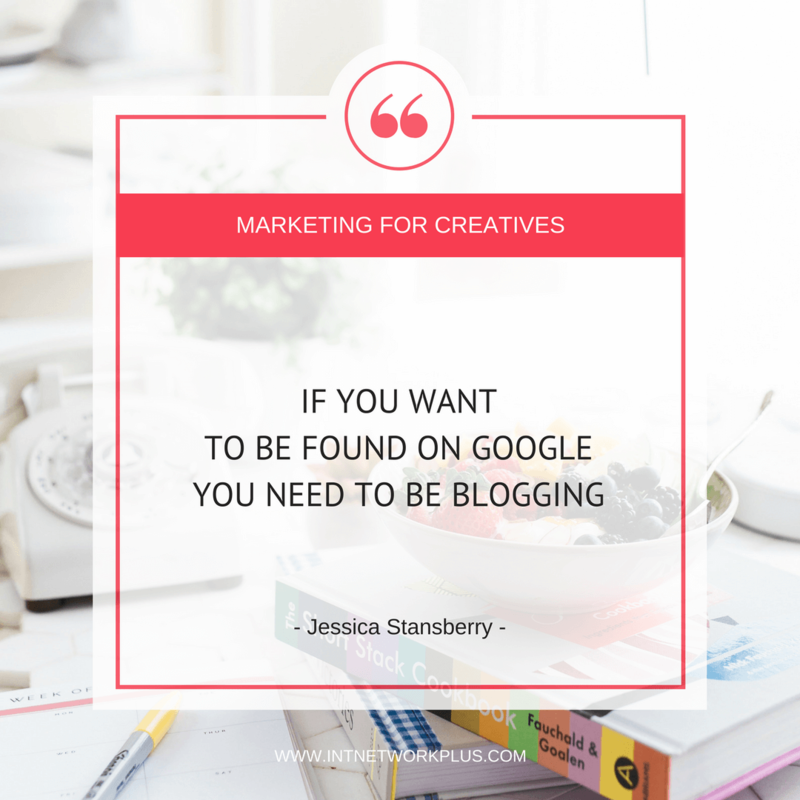 When you have a blog it maybe not easy to bring more people to read your blog posts and even more difficult to attract those who can become your clients. Today we will cover how to come up with the blog post ideas that will be interesting to your potential clients, how to attract the right audience and the ways to convert them to the sales. 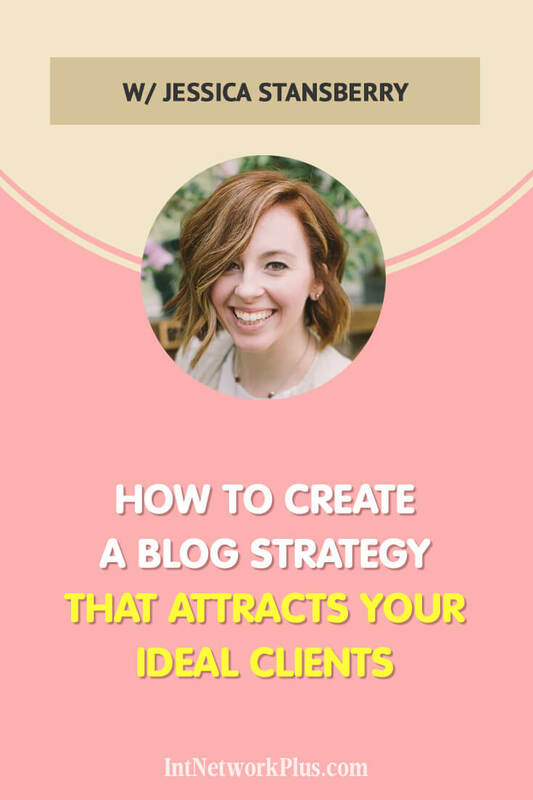 In this episode, Jessica Stansberry shares how to create a blog strategy that attracts your ideal clients. Jessica is a video marketing strategist for rockstar business owners who are ready to up-level and start using video to market their business better. She also specializes in systems, sales funnels, and content marketing. She throws down knowledge-bombs with weekly free blog content, a YouTube channel, eCourses, 1-on-1 consulting, done-for-you services, and her free Facebook group. [19:21] Why the site on WordPress is better than using services like Squarespace, Wix, Weebly, etc. Jessica, please tell us a little bit about yourself. How did you start with web design and turned that into a consulting business? Sure. I actually started doing web design when my first son was born. I have a bachelor’s degree in Advertising and Design so I had been freelance designing for years throughout corporate America and all of that good stuff. But when my son was born I wanted to stay at home and web design was a little bit more of a consistent and higher income than just freelancing. So, I kind of morphed into that. So I kind of morphed into teaching people the technical systems and things with their business and then now kind of talk a lot about video and content marketing. A big question which people ask me and many creative entrepreneurs wonder about, is blogging still worth it and do people need a blog? Does someone read it? Let’s say I’m a web designer and you’re a web designer and we both have websites that we put up that have the keywords for web designer, but I’m blogging and using other keywords and using other terms that people are searching for and all of that and you’re not, my site will be found way quicker than yours. So, it’s definitely still worth it for the SEO. Then on top of the SEO it’s worth it for the social proof that you are actually involved in your business and it’s not one of those things where you just put up a website and hope people come. And then the third reason that blogging is still worth it is because it gives you an opportunity to talk to your audience in your own voice and let them get to know you way quicker. But what are the benefits of blogging for small businesses or creative entrepreneurs? Many people just put there maybe a picture or two if they are photographers or they are a makeup artist. Oh, right. That’s not what you should be doing at all. 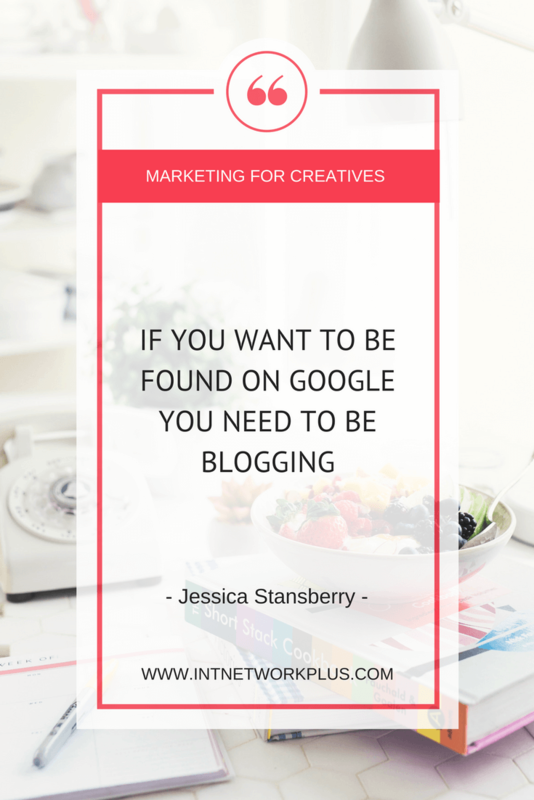 Blogging, again with the SEO, that is the biggest benefit and it’s because we want to be found on Google. If you are, let’s say a photographer, instead of doing a blog post titled Family Photographer Phoenix, Arizona or whatever, you would want to really research your market and check things out and see what your ideal client is actually searching about. So maybe your ideal client is searching for photographers in Phoenix, Arizona, but maybe they’re also searching for family-friendly activities in Phoenix, Arizona. 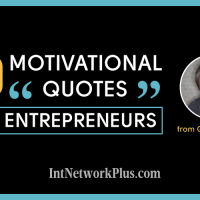 As far as creative entrepreneurs go, I can tell you without a shadow of a doubt that about 85% of the people who currently know me or are in my group or are on my email list or are in my programs, have found me because of my blog post. So, I would be 85% less as far as those social proof numbers if I wasn’t blogging. You mentioned the ideal client. 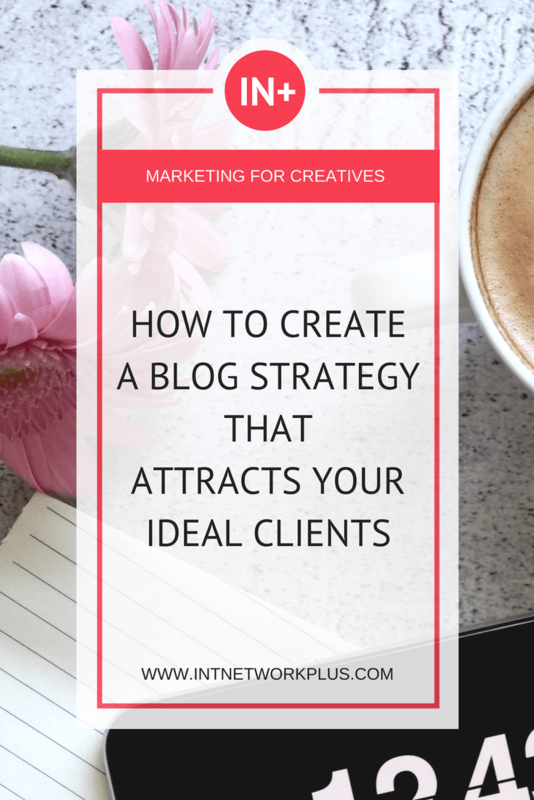 So today we’re talking about how to create a blog strategy that attracts your ideal client. But before we get into a blog strategy, is there a difference between the ideal client, like the avatar which we use for the offline business and the one which we can…should we create a different avatar for the blog post? No, it’s the same person. You have to think outside the box with blogging. So, again, let’s say you’re the photographer in Phoenix, Arizona and your ideal client lives in Phoenix, Arizona and has a family. It’s the same person for the blog but you have to think about the other things besides photography that they are wondering about. So, for instance, for me, my ideal client is entrepreneurs who want to grow their business. That’s kind of my avatar. With my blog, I want to teach them how to use video. I want to teach them how to use content to bring people into their business. However, if I just talk about video and content they may not even be ready to search for that yet. They may be just searching for how to use Trello or how to work their camera or how to set up this certain system or how to set up a sales funnel because they’ve heard that. So all of those things, I don’t necessarily teach them. I don’t teach anything about Trello. I have no courses about Trello or anything like that, but my ideal client is searching for it so I’m going to talk about it so they’ll find me and then learn what I do and that they need what I do. So, the client doesn’t change. It’s just that you have to think outside of the box when it comes to blogging. And how to attract the ideal client that can become your customer? Because many people can search for this information and some of them can be your avatar, but not all of them will become your customer. Right. You have to be realistic with yourself. Are you looking for six-figure business owners, seven-figure business owners, five-figure business owners, what are you looking for? 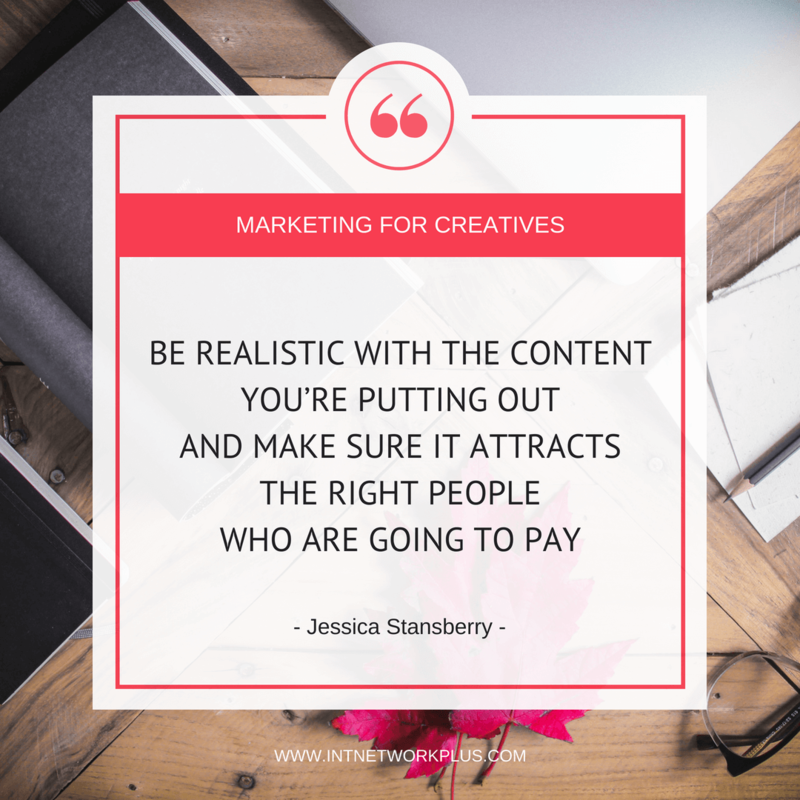 And be realistic with the content you’re putting out and making sure it attracts the right people who are going to pay. My biggest example of this is, let’s say you’re wanting to attract six-figure business owners and you’re a copywriter, and you want the people who are higher level who are ready to just hire it out and don’t want to do it themselves anymore. If you’re putting out content constantly on your blog about how to DIY your copy or how to do it yourself or how to write better, those kinds of things, you’re attracting beginners who will never pay the prices you’re charging because you’re technically charging prices for six-figure business owners. 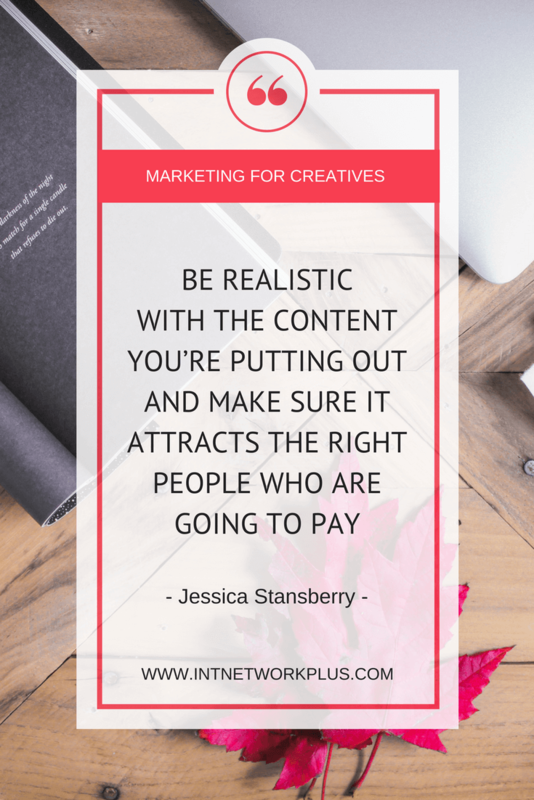 You have to be really conscious of who you want to attract specifically, how much they’re going to pay for that service that you’re offering, and is the content you’re putting out in conjunction with that. We are going to switch to the blog strategy. How do we create a blog strategy that will attract those clients? Basically, you need to be blogging at least once a week. To make Google happy, once a week is kind of the magic number. If you want to do it more that’s fine but once a week is totally what you should be doing. Less is going to make you look less consistent than someone else so I would stick with once a week. That would be the first part of the strategy. Are they wondering about Trello? Are they wondering about video marketing? Are they wondering about this? Are they wondering about that? And write down a list of ideas that you could teach about. Another really good idea here is to go into Facebook groups and type in keywords that you want to talk about. The other thing I would say on a blog strategy is to make sure you’re doing it in conjunction with what your business is doing at the time. So, if you’re going to do a webinar on a certain day about a certain topic, maybe all of your blog post for four weeks before that are kind of about that same topic so that you’re kind of leading people into that webinar. Or if you’re going to launch a program or a service, maybe all of your blog posts are about that specific area of expertise and then you launch the service. Do you have any tips on how to interact in those groups on Facebook? How to bring people to the blog? On Facebook you definitely don’t want to be super spammy and constantly be posting your links to your blogs. We all know that that, number one, will get you kicked out of a Facebook group and number two, looks really spammy so people just don’t click it. I have found that even if the Facebook group allows self-promotion or even if it’s a post where they’re asking for self-promotion if you drop the link people just don’t respond to that. But now a lot of people will be like, “Oh, I kind of read about this on this blog post.” and that will look spammy and won’t really get you anywhere. But my other suggestion is to have your personal profile Facebook group ready. What I mean by that is we all know that when we interact in Facebook groups we have to use our personal profile we can’t use our business pages. You need to have your Facebook profile totally ready that when you answer a question and you answer it concisely and you answer it in a way that really helped somebody, then when they hover over your name, because they’re going to, I promise, and they want to see more about you that they’re seeing exactly how they can get to your website and exactly what information you have. So, for instance, you might change out your timeline photo with your newest blog post and put a link to that in the timeline photo. You might also just have a timeline photo that says ‘read my latest blog post’ and link that way. My biggest point here is the timeline photo can be one of your biggest pieces of traffic to get people to your site. So if you’re not optimizing that on your personal profile while you’re interacting in these groups you’re totally missing out. 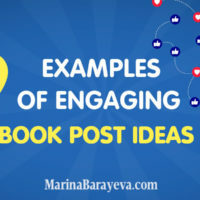 What would you suggest, for example, if on the timeline we just put “Read this article on my blog” but you interact in different Facebook groups and you share different blog posts, do you have the universal option for the timeline to direct people to our blog? Yeah. My timeline for instance, just says ‘I help people be more influential in their business’ but with content and video marketing and it just links to my website. But as soon as they go to my website they’re going to find all my blog posts. So that’s kind of generic. But, like I said, I don’t drop a blog post link anywhere unless someone specifically asks for help in that area. So I don’t even use the prompts in the groups to promote my blog post. I don’t ever spam groups with my blog posts. What I do is I get in and I am really helpful as a human and I answer their question as a human. Sometimes even if I do have a blog post for it I will just answer their question and say, “Oh, I have a blog post if you want to read it.” and that helps them see that like I’m not in it just to get them over to my blog. I really did want to help them. And if I just answer the question and never link to a blog post and they hover over my name and see that timeline photo they’re going to go to my website and they’ll find the blog post anyway. So my biggest advice is just to be human in Facebook groups and not constantly be dropping links. Just be really helpful and if you’ve got everything set up on your personal profile correctly then people will find you regardless. Okay, Jessica. You gave us some tips on how to bring people to our blog, you talked about how to find blog topics, but one of the common problems that people face is that after a few posts you just run out of topic ideas even if you planned several before. What to do in this situation? So, back to the idea of going into Facebook groups and searching for your keywords. I can go in about twelve Facebook groups right now and type in YouTube or video or content or marketing or some combination of those keywords and find posts that people have asked about those specific things and I can go ahead and answer them in the in the Facebook group if I know the answer and if they need help. But I can also file it away as a blog post idea. You also want to be really conscious of Search Engine Optimization. So what are people actually searching for that you are your ideal client. So you can go through Google Analytics and Google keywords and find lots of ideas as well. Pinterest is another good place to find ideas and polling your audience. This is something I do all the time. I will say, “Okay. What do you want to learn about next?” and I give them a couple of options and they answer me. And like if they picked SEO, I can say, “Okay. I know there’s like twelve blog posts I could do with that that go along the lines of SEO and what that means. So polling your audience, getting in these Facebook groups and just listening and being attentive are my biggest ideas for getting topic ideas. I see, but SEO is a little bit of a long-term game, do you have any tips other than Facebook groups on how we can get more people to read our blog in the short term? How can we get more readers? I actually don’t think SEO is a long-term game. I can get one of my posts ranking on the first page of Google and the first page of YouTube within a couple of days of posting. So SEO is a huge piece to it. I really just optimize the snot out of my blog posts. So the biggest components of SEO are your keywords and being consistent putting out content. Those are the two things that Google really wants to see, that you’re consistent and that you have the keywords the person is searching for. The biggest surface level tips I can give are to be using WordPress, not Squarespace, not Wix, not Weebly, not anything like that; be using a self-hosted WordPress theme. Because they are built to put SEO out into the world way better than these other systems are and you can beef them up. So with Squarespace for instance, if you go in and you write a blog post you can’t really do anything other than putting the keywords in the title, the things that a lot of people know about. But in WordPress, there are plugins that help you do more to get those keywords in that blog post. So there’s a plugin called Yoast which is like toast with a Y at the beginning, and it is amazing. It works on a red light, green light, yellow light system. Basically, a red light means you haven’t done enough work here to make this blog post come to the top of Google, a yellow light means you’ve done okay and then a green light means you’ve done really good. And it gives you tips like, your keywords are not in the first paragraph or your keywords are not in the alt text of the image that’s on that blog post. Also, the other thing you really need to take away from this, and I’m not just saying this because I love YouTube, but this is literally one of the biggest reasons I can do this, is to publish a video on YouTube with the same keywords and embed that YouTube video in your blog post. And you don’t have to be a YouTuber. That’s not at all what you have to want to be doing. I publish videos on YouTube just to help with SEO on my blog for about 18 months before I really started getting active on YouTube. But the thing is Google owns YouTube so they love that people are using their platform. 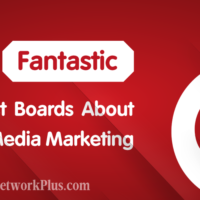 And then I also use Pinterest to optimize search engine traffic from there. So basically, all of my traffic that comes into my website, nearly, all comes from organic search and I have tens of thousands of views on my website a month. So by organic search I mean that they’re either coming in through Google, they went to Google and they’ve Googled something, found my post and came to my blog, they went to YouTube and looked up something, found one of my videos and came to my blog, or they went to Pinterest, looked up something, found one of my pins and came to my blog. That’s an interesting strategy. And if you write a blog post on your WordPress site and then you create a video about the same topic, do you share different content or do you share a similar idea? How does it work? The video needs to be the same content. So I say the same things in my blog post that I say in my video. It’s not scripted. I don’t just read my blog post. And now I do it a little differently. I record the video first and the blog post comes second. We just kind of go based on what the video says as to what the blog post says. But it should be the same content. That way you’re getting in front of people however they like to learn. So whether they like to learn on YouTube or they like to learn on blogs or whether they’re searching on Google or they’re searching on YouTube, you’re getting in front of them and also having those same keywords that are just giving you nice little SEO juju, I guess. Okay. We got people reading our blogs. How do we now convert them to customers? That’s a really good question. So, this is something I do a lot and I could do better at, but I also feel like I’ve done a decent job. What you want to do is you want to have a sales funnel in place. So that’s tip number one, always have a sales funnel in place. But that starts with having good content that people are actually going to find on your blog. Then, having a free piece of something that they can download or get right then. 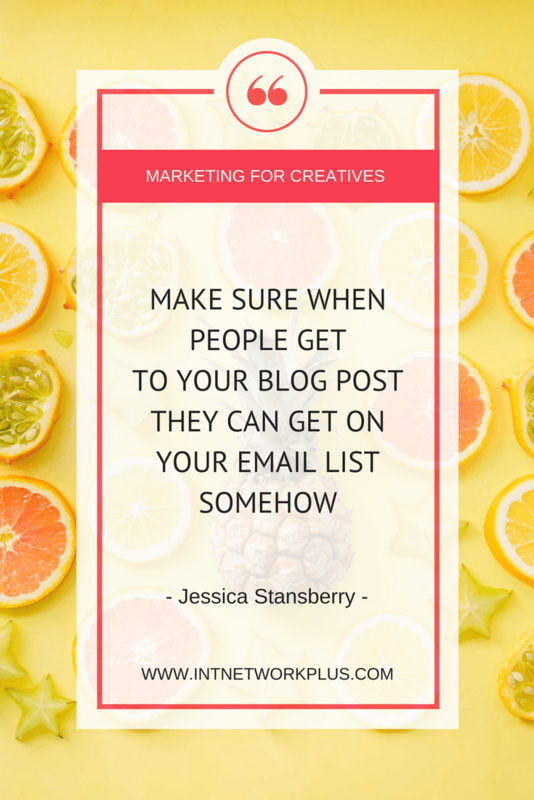 So you always want to have an option for people when they search and they find your blog or they see it in a Facebook group or whatever, however, they get to your blog, you always want to have an option for them to get on your email list. And it should be something that they will want. About six months ago and for about a year before that I was recreating a new opt-in for every single blog post because I knew it was highly relevant for those people. If I was writing a blog post about Trello I would have an opt-in where you could copy my Trello boards. If I was writing a blog post about YouTube I have an opt-in about YouTube; that kind of thing. 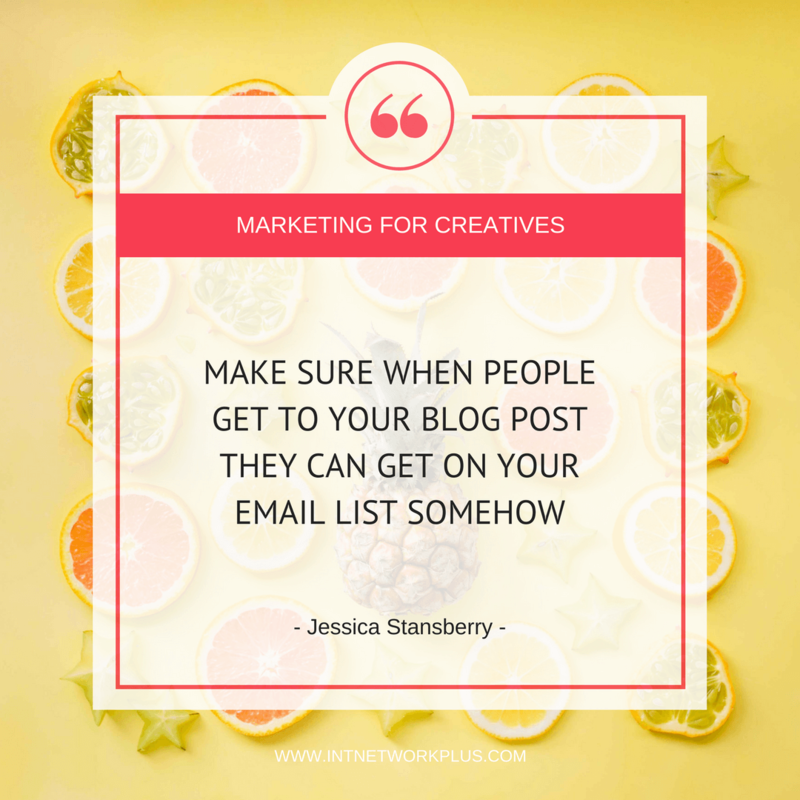 You want to make sure that your people when they get to that blog post that they can get on your email list somehow. And then you want to have emails that come after they get that, that kind of nurture them through the process of buying your thing. So they come to your blog kind of an accident but they come out the other side a paying customer. How did you organize that that on every page people could sign up for something? Because usually when you embed a form on the website it’s only one form for all the pages. Another plugin? I don’t embed it on all the pages. That’s not at all what I do. I embed it per blog post. So it’s not like I put a code in there that’s going to put something across all of the pages. What we do is, we just put a specific code that has a button that leads to either a form or a pop-up box or something for that specific thing. You could easily do it just with your email marketing system. If you use ConvertKit or any of those kinds of systems you can create a new form for every single opt-in that you have and embed that form specifically on that one blog post. They don’t have to go across all of them. So basically, you create a new form and just in the welcome email they get, they have different links? In the welcome email, they’ll have the link to the one they specifically signed up for. But there might be another welcome email going out for somebody else who signed up for another opt-in. Ok. You got their email. How do you sell via your blog then? You get their email address and it’s then off the blogs plate. Now it’s on your email marketing system’s plate. You get them on your email list and you send them that welcome email. Then you do a really good job of letting them get to know who you are, letting them realize that you care about who they are. This is something I do on my email list. I will say “Reply back and let me know what you do.” or “Come in my Facebook group and play two truths and a lie.” or whatever. And so I invite them to come be where I hang out so that they can get to know more about me and I can get to know them and we can really establish a relationship. And then throughout the emails, I tell them more about myself, I help them more. A lot of times I will point people, like in the second or third email that they get, I will point people towards another piece of content that might be helpful for them. I’m helping them along the way and then I start talking to them about what I will eventually want them to buy. So, maybe in the fourth or fifth email I might say, “I use Trello to plan out my video marketing or my content marketing strategy and here is how.” and I kind of show them how to do that and then I start talking about my content marketing strategy because right there bridged the gap of why they would care about my content marketing strategy if they came in through a Trello opt-in. I just kind of tell them what I want them to know and then I invite them to either purchase or watch a webinar where I will pitch them or something. It’s a process. It’s not just like they found you on your blog and they buy from you. It’s definitely a process of them getting to know you and feeling like you care about them and feeling like you are going to help them solve whatever problem they have and then they’re willing to spend their money on you. Yeah. Sure. You can definitely do that. I talk a lot about this here in my local area because people are always like, “Yeah, but I don’t sell online. How do I use this?” The biggest tip there is to make it location specific. So let’s say you did have a salon, since that’s the example you used, and you have a blog post that is How to Curl Your Hair, I’m just going to go with something really generic, but let’s say it’s How to Curl Your Hair. The opt-in for that though, you would want it to be location-specific. So maybe the opt-in, the freebie that they get is a printable version of how to curl your hair and a 20% off coupon that they can use when they come into your salon. And so you’re specifically telling the people when they get ready to opt-in that you want them to come to your salon. So just by the copy involved and by the language involved you are likely going to repel people who are not local. But another idea is to really focus on local specific posts. So instead of saying how to curl your hair, because that’s something anybody in the world could find, you might say, “We’re ranked in the best restaurants in this area.” And even though you’re a salon you know that the people reading that are in your area. They’ve opted in for restaurants but you know that they’re local because the whole post was about them being local. And now you can start talking to them about who you are and what you do, what your business does, how it can help them and then you’ve turned them from looking for restaurants in your area to coming into your salon and getting their hair done. Interesting idea of how to localize it. There are a lot of tips. If you would put that into a little more simple strategy, what are the three steps our listeners could begin with to create a blog strategy that attracts their ideal client? First and foremost, I would say get it on the calendar and make it a non-negotiable because that’s one of the big things for people. They will get the idea in their head that they’re going to write these blog posts and they’re going to create a blog. But they do it once or they do it twice and then they just kind of drop the ball because they got busy and all of that. But you will never thrive with a blog unless you are consistent. So one, I would say put it on the calendar and make it a non-negotiable. Two, go into these Facebook groups, go into your email list, go into wherever your ideal client hangs out and just create a dump list of all the topics you could possibly blog about. If you are a Trello user or an Asana user, or really just like in a Google doc or an Excel spreadsheet or whatever, just make a running list of all the things that you could possibly talk about. And that way you never run out of ideas and that’s not what keeps you from being consistent. So that’s step one and step two. Step three would be to have a freebie ready for every blog post and make sure that you have a funnel built into those. That may be your last very last thing you do. 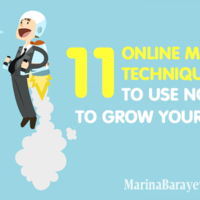 Don’t hold off on blogging because you don’t have your funnel ready. What I would highly suggest is make sure you have a freebie. Make sure they can at least get on your list and you can say, “Hey, here’s your freebie.” and you can build out the funnel later. So I guess I should erase the final part. The step three should just be make sure you have a freebie and get them on your email list with every blog post because the funnel is where you’ll make the money, but that often holds people back from starting the actual blogging process. I don’t want to hold anybody back. Do a freebie, be consistent and get it on the calendar and have a bank of ideas so you never run out of ideas. Fantastic, Jessica. Great tips. Share with us how we can connect with you and find out more about you. Sure. You can connect with me on my website, that’s probably the best way, at JessicaStansberry.com or on my YouTube channel which I’m highly active on right now, which is YouTube.com/JessicaStansberry. And I would love to have you guys come hang out with me on my free Facebook group called Rising Video Rock Stars. I also have a podcast called All Up in Your Lady Business and lots of ways you can connect. I make sure there are no shortages of ways where you can find me. So just go to my website and you’ll find them all. Thank you so much. It was great to have you on the show today.